The Brightleaf Hoedown was held again this year on the Court Square in downtown Yanceyville. Our club’s booth was a great! We talked to a lot of people about honey bees and beekeeping. Several signed up for our beekeeping course next year. See our Facebook page for photos. Mr. Robert Neal, discussed fall management and preparing your bees for Winter. 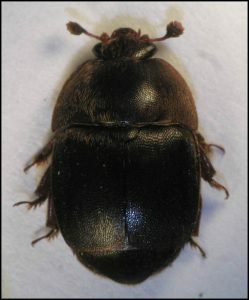 Mr. Phil Barfield, discussed the life cycle, identification, behavior, monitoring, and control of the small hive beetle in the hive. Mr. Will Hicks, our state apiary inspector, was our guest speaker. 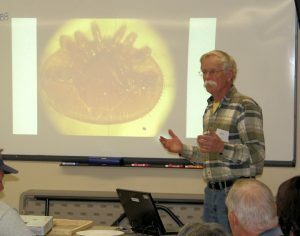 He spoke about integrated pest management (IPM) for varroa mite control. 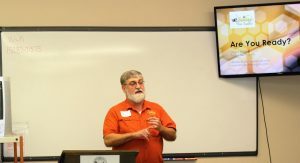 Mr. Randall Austin, NCSBA Master Beekeeper, presented “Liquid gold – honey harvesting, bottling, labeling requirements and marketing tips” at our May beekeeping meeting. 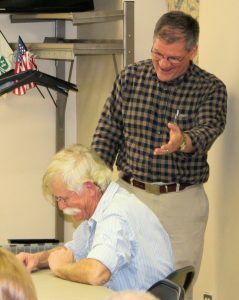 Mr. Phil Barfield, NCSBA Master Beekeeper, presented “Hunters and gatherers – Food and water sources for your bees” at our April meeting. 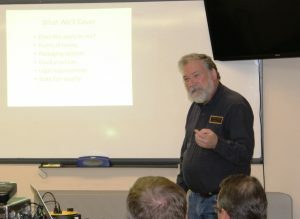 Mr. Todd Walker, NCSBA Master Beekeeper and Regional Director, presented “Let it flow – preparing for nectar flow” at our March beekeeping meeting. 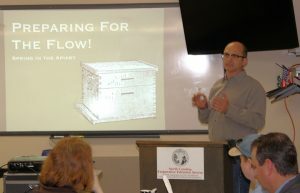 Mr. Joey Knight, Caswell County Extension Director, presented “Food and water for your bees” to our beekeeping class. Mr. Pat Jones, NCDA&CS Pesticide Section, presented “Protecting the pollinator – Apiary registration and BeeCheck.” Mr. Don Hopkins, NCDA&CS Apiary Inspector, also attended to answer beekeepers questions. Mr. Don Hopkins, NCDA&CS Apiary Inspector, taught our beekeeping class about honey bees’ enemies, pests, and diseases. Mr. David Bailey, owner of Bailey Bee Supply, was our guest speaker at our first meeting and presented “Are you ready? Bee season checklist.” He went over equipment we needed and some we didn’t. Ms. Nancy Ruppert was our guest speaker and presented “Beekeeping in Late Winter/Early Spring“. She stressed the importance of maintaining a strong, healthy colony by ensuring adequate food stores (pollen, honey/sugar) and controlling pests (mites, mice) at the right times of the year so that winter bees can have the best chance to make it till February. 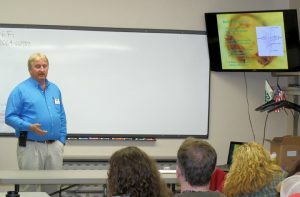 Larry and Martha Hupp were our speakers and presented “Winter Bee Feeding Methods with Recipes“. Recipes included one for fondant and one for sugar cakes. Videos shown included Making/Giving Winter Sugar Patties W/Essential Oils To Our Honeybees and Make bee fondant correctly- Temperature, acid and time. 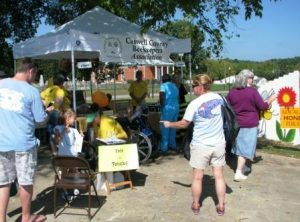 The Brightleaf Hoedown was held again this year on the Court Square in downtown Yanceyville. Our club’s booth was a tremendous success! Our presence was recognized throughout as kids and adults buzzed around the Hoedown with bees painted on their face and sporting bee antenna. The observation hives were a big hit and allowed our volunteers to engage visitors and educate the public about honey bees and beekeeping. Several visitors are interested in becoming beekeepers and have signed up for our course beginning in January. Our club made a positive impact on our community. See our Facebook page for more photos. Mr. Patrick Ferrer and Mr. Mark Bennett from Dadant & Sons in Chatham, VA discussed Varroa mite control and various treatments and brought related products to show. 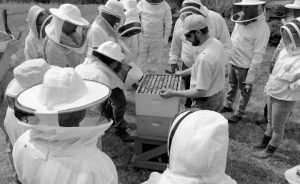 Mr. Robert Neal, well-known local beekeeper with many years of experience, a beekeeping instructor, a CCBA founder, and our CCBA past president presented “The Honey Flow is Over–What to Do Next“. 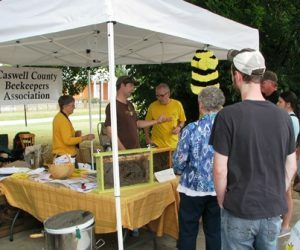 The NCSBA summer conference was held July 7-9 in Hickory, NC and hosted by the Catawba Valley Beekeepers. 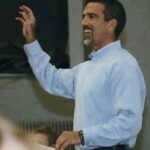 Presenters included Dr. Marion Ellis, Jeff Berta, Dr. Hongmeill Byarlay, Dr. Vanessa Corby-Harris, and others. The topics focused on honey bee health and nutrition. 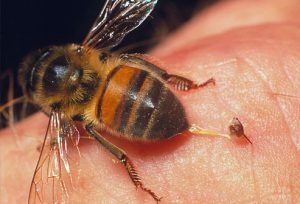 Varroa mites continue to be the number one threat to bee health. Mr. Joe Cobb and Mr. George Williamson, local area beekeepers and fellow club members discussed “Making Your Own Queens” and provided valuable information and lessons learned from their beekeeping experience over the past years. We met at Larry and Martha’s honey house in the cool of the shade and discussed methods and showed equipment used to remove frames of honey from hives (fume board, Bee-quick, brush); demonstrated uncapping frames of honey by using a hot knife, a roller uncapper, and a cappings scratcher; discussed and showed extraction equipment (uncapping tank, extractor, collection bucket, filter/strainer). 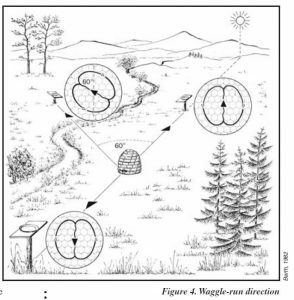 Cheryl McCauley showed her flow hive and explained how it works. Making Nucs was presented by Todd Walker, President of Person County Beekeepers Association, Master Beekeeper, and our NCSBA Piedmont Regional Director.